Joan of Arc is one of my favourite landmarks in Paris. 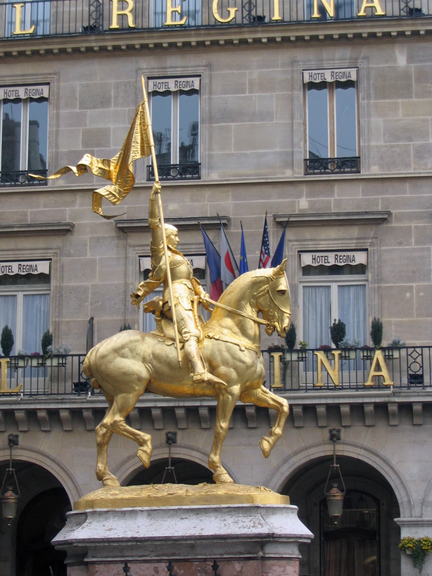 She sits on her golden horse, outside the Hôtel Régina in the heart of the city, looking confident, capable and courageous. The sculptor was Emmanuel Frémiet (December 6, 1824 - 1910). I think he did a great job and deserves more recognition. 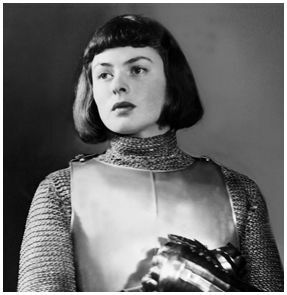 Of course, we have no idea what Joan really looked like, so you can pick the version you prefer. ever having seen her. 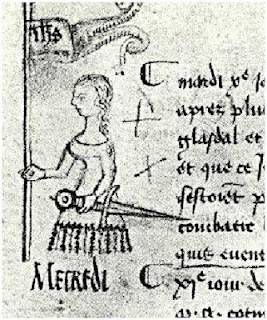 Drawing by Clément de Fauquembergue, 1429. Yet another version - Ingrid Bergman in the role. I’d like to think she looked like Ingrid Bergman but I have my doubts. Not to say the real Joan wasn’t fantastic and all, but she was a bit on the odd side…. I’m not judging you understand but there are medical reports and not everyone is convinced she was altogether there. Ingrid looks decidedly in control. I’m still impressed that we can read 600 year old transcripts without so much as leaving our chairs. The French sure know how to keep history!